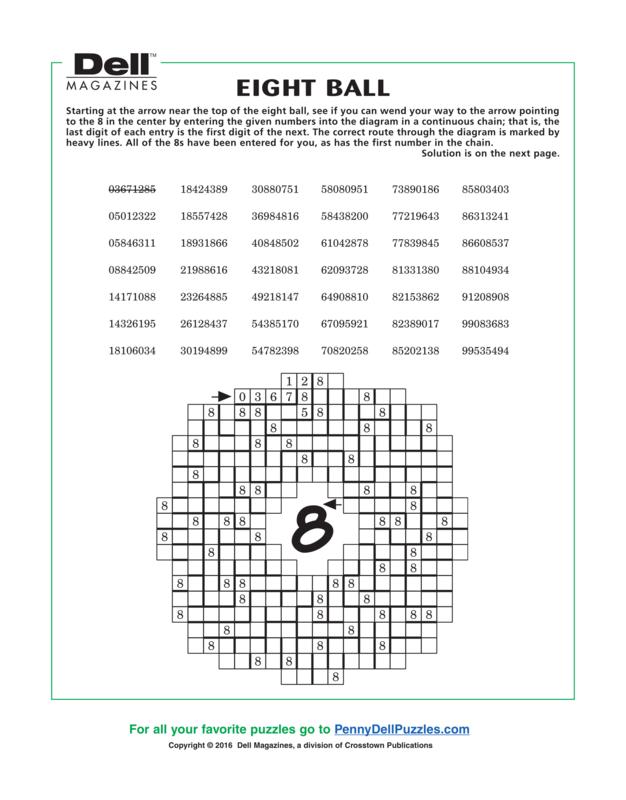 I remember, when filling out variety puzzle books from Dell Publishing, there being one or two logic puzzles per book called "Eight Ball." I really like these puzzles, but I can find NO information on them anywhere! It was a deduction puzzle about putting groups of 8 numbers into a labyrinth shaped like a giant 8 ball. Some numbers were already filled in, and each number group started and ended in 8. Is there another name for this puzzle? Or is there more information about it... anywhere? Somewhere I can play it without buying an entire book for one puzzle? At first it sounded like you are describing Logic Art puzzles or Nonorams. But those can be in any shape, not just and eight ball. Sample here. But it turns out what you are looking for is actually a proprietary PennyPress puzzle which doesn't have references anywhere else. I don't think there is any other generic name for this. It is just called "Eight Ball" and appears under the "Variety Puzzle" section.